The weather had been quite flippant in the last few weeks and we find ourselves so looking forward to summer that we are wearing jandals already, looking longingly to the sky as if to say ‘I demand summer weather, NOW!’. Of course that had no results whatsoever and we resolve to having warm, hearty, comfort food once again. 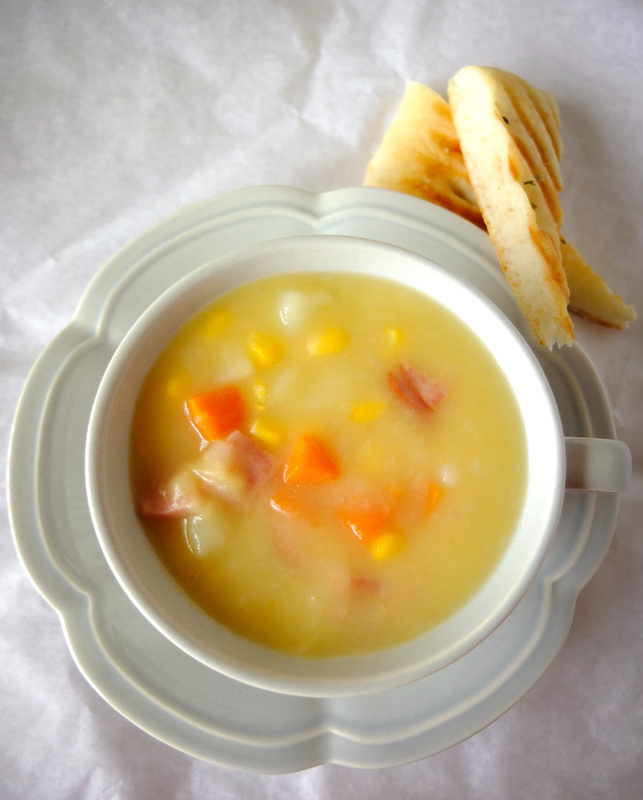 What can be better than a good old mug of soup in a blustery cold afternoon? 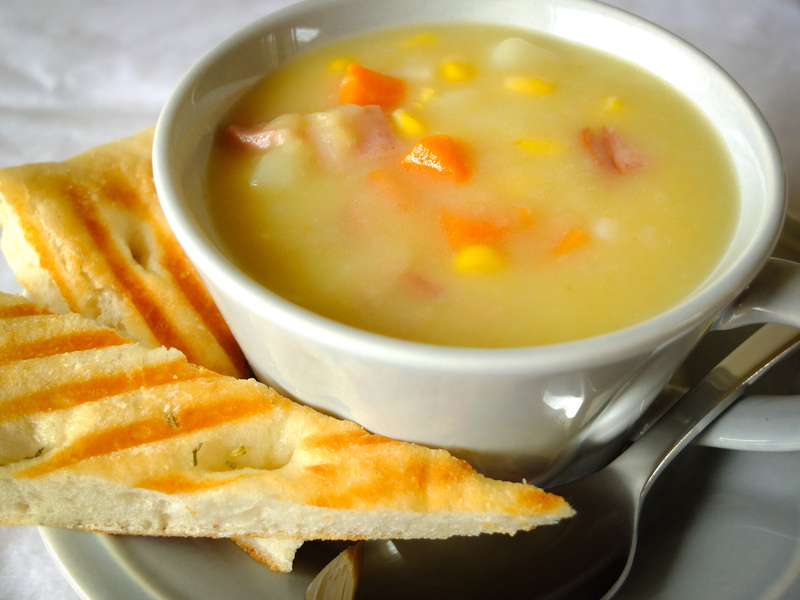 Why, a good ham and potato chowder soup with grilled garlic pizza bread for dunking of course! This soup is made with a roux, but rather than using a separate pot to prepare it, I add it all into the pot and cook it at the same time. Less washing, more time to enjoy the food and company! This makes enough for 6 servings, and I usually freeze half for later. In a large dutch oven pot cook ham until fat is rendered and bacon is crisp. Add the onion and sauté for just 2 minutes. Let them cook till transclucent, but not browned. Add the potatoes and carrots to the pot. Cook for another 2 minutes, moving the potatoes from time to time to make sure the surface caramalises a bit. Push the vegetables to the side of the pot so that you have the centre of the pot clear of food. Add the butter and flour in and stir vigourously. The flour needs to cook but you don’t want it to stick to the bottom of the pot. At least not so much that it browns. Cook for another minute to ensure the flour is completely cooked. Add the hot chicken stock a ladle at a time to the pot. Stir to mix before adding another ladle. You can add as much as you like to achieve the consistency to your liking. As the soup heats up it will thicken. 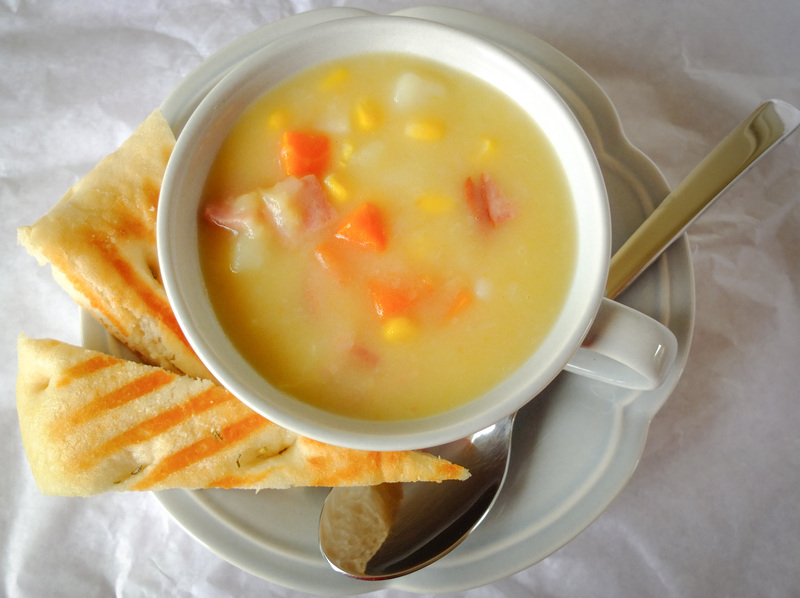 Add the corn kernels, cook until the potatoes are fork-tender. For a creamier taste or consistency adjustment, you can add some milk in, to your liking. Ladle the soup into bowls. Serve with grilled pizza bread.